Musings 'n scribblings of a philanthrope .. : TM Varghese, a patriot who gave his life for Kerala state ..
TM Varghese, a patriot who gave his life for Kerala state .. 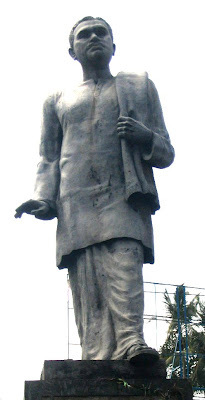 Recently when I visited Trivandrum, Kerala, I got down at Kesavadasapuram junction to have a close look at the statue of T M Varghese. Hailed as one of the Trimoorthikal in Kerala along with Pattom Thanu Pillai and C Kesavan, T M Varghese, quit a flourishing lawyer practice in the 40s to jump into the freedom movement. 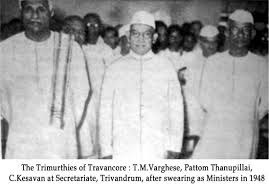 In my younger days, school history textbooks used to mention the name of T M Varghese as one of the Trimurthies of Kerala and an ardent freedom fighter, then I did not understand the depth of his contributions to Kerala society, until my mother mentioned it to me.. ..
TM Varghese was the first Home Minister of Kerala state in 1948 and it's first Education Minister too. Hailing from Thandaaneth family in Pallikkal, Kayamkulam, he had great zeal for public service. Being a member of the Legislative Council, MLC, he strained his relations with the Dewan Sir CP Ramaswamy Iyer and jumped actively into the freedom movement in the late 30s. As an individual, he never thought of personal gains and pleasures, gave his life and earnings for the people of Kerala. He even supported the Kerala State Congress during its initial formative stages for some years. The present day politicians at the centre and the state may consider him to be a fool who never cared for himself. He never made money for twenty generations, he never grabbed the poor man's lands. He will always live in the minds of millions of Malayalees as a person who lived by his word, for values and principles in life, who fought to upkeep the high standards of probity in public life. The two snaps here give an idea of this great personality. He is my uncle ..
Wikipedia link is here ..
A photo of the couple..
Is the left really serious about the country ?? Finally the CPM is getting what they deserve ..